Love is in the air this Valentine’s Day at Benny’s Chop House! The independently-owned River North steakhouse offers diners the ultimate way to indulge with an array of decadent menu offerings, including the infamous Chocolate Soufflé. From those celebrating their 25th wedding anniversary to the ones going all out for their second date, Benny’s is just the place to turn up the romance this holiday. From February 13-16, the restaurant will offer a specially-curated menu for “Couples Who…” including the Shellfish Tower for Two for the couples who want healthy and decadent, Japanese Black Grade A5 Tajima Kobe Filet for those who splurge and duo of Jumbo Prawns and Shrimp DeJonghe for those who are hot and cold. The full dinner menu will also be available. For more information and for reservations, visit the website. Eden, the new American restaurant by husband and wife duo Jodi Fyfe and Executive Chef/Partner Devon Quinn is celebrating Valentine’ s Day with two decadent prix fixe menus including a vegetarian option. Chef Quinn will be using ingredients straight from the on-site garden on both menus with dishes including Potato and Lentil Samosa (Pickled Mango, Tamarind, Chicory Yogurt, Mint, Coriander), Lobster Tajarin (Peppadew and Calabrese Peppers, Tomato, Uni, Cured Yolk) and Bacon Wrapped Painted Hills Tenderloin (Béarnaise, Wild Mushrooms, Truffle). Guests will be able to indulge in a Pomegranate Chocolate Pavlova (Pomegranate Meringue, Chocolate Cremeux, Pomegranate Citrus Compote, Pomegranate Gel, Chocolate Lace Tuile, Chocolate Soil, Herb Granita) to finish off the meal. Both tasting menus are available for $125 per person or wine pairings can be added for a total of $150. Reservations are encouraged and can be made here. “Love is in the Air” this Valentine’s Day at ENO Wine Bar. The Magnificent Mile staple, known for its impressive menu of wine & chocolate flights, is offering guests the opportunity to take their love to a whole new elevation. Each guest who celebrates Valentine’s Day with ENO Wine Bar will get the opportunity to win a private helicopter ride for two – complete with a complimentary champagne toast, two chocolate roses and one keepsake photo. This helicopter experience will cover 24 miles of the Chicago skyline and feature some of the city’s most popular sites including: Willis (formerly Sears) Tower, Navy Pier, the Magnificent Mile, and much more. Located inside the InterContinental Chicago Magnificent Mile, the lavish steak house will be offering a celebratory prix fixe menu for two for $233. The tasting menu is perfect to share with a loved one and will be available Thursday, 2.14 through Sunday, 2.17. Chef Couper has curated a menu of restaurant favorites including: Garlic Bread, Maple Glazed Bacon and a Broiled Filet Mignon with Sugar Cane Skewered Shrimp, Scallops and Lobster. The iconic chocolate cake will also be available for dessert. Reservations are available online or by calling 312-321-8823. Seafood focused restaurant, Portsmith is pulling out all the stops for its Valentine’s Dinner Package on Thursday, February 14. Guests can enjoy a 4-course menu of Chef Nate Henssler’s favorites for $88 per couple. The menu begins with Oysters Rockefeller (Creamed Basil, Lemon Foie Gras)followed by Mixed Greens and Burrata (Shaved Baby Vegetables, Avocado, Cumin Vinaigrette.) The third course is the popular and indulgent Maine Lobster Pot Pie (Peas, Carrots, Tarragon Potatoes, Lobster Bisque) that is ideal for sharing! The Sweet Heart Plate rounds out the meal with truffles, macarons and ganache mousse pops by Pastry Chef Chris Teixeira. Reservations are highly recommended and are available online. Candlelit dinners are not the Valentine’s Day-way at this Fulton Market hot spot! 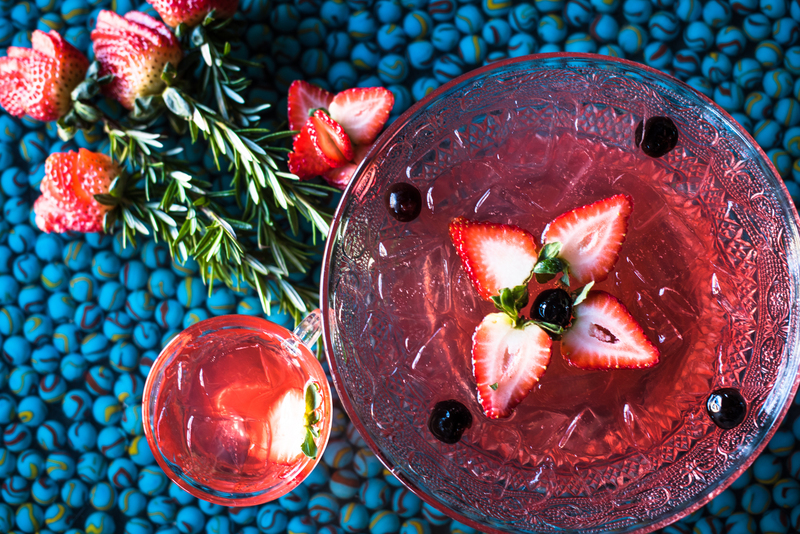 Punch Bowl Social offers love birds a different kind of date night with scratch kitchen eats, namesake punch bowls and an array of gaming options. From karaoke to bowling to Virtual Reality, there’ll be no shortage of fun this Valentine’s Day. Guests can even indulge in the specialty featured punch — Shot Through the Heart (Old Forester bourbon, Strawberry Cinnamon shrub, house-made pear syrup, Teakoe’s Pear Tea, lemon juice). Perfect for new couples, those looking to spice things up after 25 years of marriage or even gal pals celebrating “Galentine’s Day,” the eatertainment concept will have diners feeling the love all weekend long. For more information, visit the website. It’s “amore” this Valentine’s Day at Chicago’s Italian cucina! From February 14 through the weekend, The Florentine will offer a specially-curated prix fixe menu, perfect for sharing, for $120 and complete with a Prosecco toast. Guests will indulge in a four-course meal featuring Executive Chef Zachary Walrath’s authentically delicious dishes. In addition to the menu, specialty cocktails including the Mio Caro (Housemade Raspberry Limoncello, rose, lychee, lemon) and Sparkling Wine and Limoncello flights will also be available. A special Italian tradition, guests will also be treated to hand-wrapped Baci hazelnut chocolates! For those who prefer to treat their loved one (or themselves), The Florentine is partnering with Urban Stems to offer Sweetheart bouquets for $75/dozen. To purchase a bouquet, guests can call the restaurant at (312) 660-8866 before February 5. Those who order will receive a complimentary round of bubbly for the table — cheers! For more information and full menus, visit website. Recently opened modern Japanese restaurant, Yūgen is celebrating Valentine’ s Day with a special cocktail menu created to compliment Chef Mari Katsumura’s tasting menu. Guests will be able to enjoy the restaurant’s classic tasting menu that features newer dishes such as Ora King Salmon (Hijiki Sunchoke, Winter Perigord Truffle, Sunflower) and Dry-Aged Lamb and Duck (Royal Trumpet Mushroom, Pistachio Miso, Persimmon) all while imbibing in festive cocktails. Reservations are available online or by calling 312-265-1008. Guests will indulge in romance to celebrate Valentine’s Day with the J’adore Ambassador package available Thursday, February 14 through Saturday, February 16. 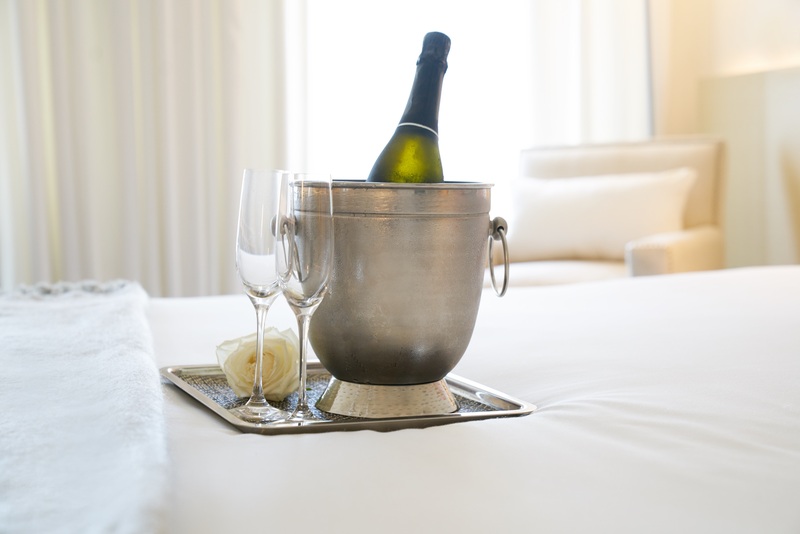 Share a Deluxe King room, bottle of prosecco and dinner at Booth One with a luxe prix fixe menu. The Valentine’s Day menu includes seasonal favorites from the Chef and dessert selections such as the Baked Alaska for Two – chocolate cake, passion fruit sorbet with Swiss meringue – that is flambéed tableside, ending the meal with a fiery finale. All guests will leave with Heart-Shaped Macarons for a sweet take-home treat. Rates start at $209 with an upgrade to a suite for an additional $50. The romance doesn’t stop with Valentine’s Day! Share something special with your loved one all month long with the J’adore Ambassador Extra. Throughout the entire month of February, guests can enjoy a Deluxe King room for two, bottle of prosecco and a $100 gift card to Booth One. Rate start at $209 with additional upgrades available. Both packages are sure to wow loved ones and are available for booking now via ambassadorchicago.com. River North’s boutique hotel, dana hotel and spa celebrates the passion and romance this Valentine’s Day with a relaxing package fit for all couples. Inviting couples to “come as they are”, the hotel provides a unique experience with its “be my valentine” package for two. Guests will enjoy an intimate and delicious four-course prix-fixe meal at Portsmith, located on the hotel’s first floor. Afterwards, they’ll head upstairs to retreat to one of the comfortable and luxurious rooms where they can enjoy private wine reserves, spa-inspired showers and more. In addition, couples can take in the romantic view of the city from the floor-to-ceiling windows. Rates start at $189 and to book, visit the website. Relax with a glass of sparkling wine while feet soak in a calming champagne rose bath sprinkled with fresh rose petals. Nails and cuticles will be cleansed and exfoliated with a sugar scrub. After a foot massage, guests will receive a paraffin treatment. To finish, choose between a professional nail buff or polish application. The perfect tailored spa experience for couples; both guests choose one of the spa’s specialty massages including classic Swedish, aromatherapy, deep tissue and more to be enjoyed side-by-side in the duet suite. Open for hotel guests and Chicago locals, spa at dana is the perfect backdrop for a relaxingly romantic Valentine’s Day. More information on treatments and bookings can be made on the website or by calling (312) 202-6040.